Ever catch yourself squinting at your phone when trying to watch a live sports event? The NBA feels your pain and will introduce an extra layer of production to all games this season in hopes of enhancing the experience of watching a game on a mobile device. NBA Mobile View is intended to meet the visual demands of watching a game on a mobile phone by presenting a tighter, zoomed-in shot of game play. To accomplish this, the league will add a camera to each of its 29 arenas and dedicate a producer for every regular-season game to provide angles that will be unique to users of NBA League Pass, the league’s out-of-market subscription service. This offering is a joint effort of the NBA and Turner Sports through their NBA Digital partnership. In the league’s estimation, what works on a big television screen doesn’t necessarily translate to a significantly smaller screen. The ability to pull in close and present a more close-up, large image of the action, player’s faces, etc., will make for a more enjoyable viewing experience and a more engaging broadcast. UPDATE: According to Steve Hellmuth, EVP, operations and technology, NBA, the league will provide the camera and operator at the arena, the dedicated producer (who will be stationed at NBA Entertainment’s studios in Secaucus, NJ), and engineering support. The signal from the camera travels into the production truck of either the national or regional home broadcaster. It is received and processed through the truck and is meant to do so in the background so as not to affect the television crew’s work. From there, the signal is sent via the league’s HSAN network to Secaucus, where the full dirty game production is conditioned by a producer before distribution to media partners around the globe. In addition to integrating the Mobile View camera, the Secaucus-based producer will also have other responsibilities, such as adding closed captioning, coordinating rolls of commercials, etc. The added camera is an alternative to the traditional camera 1 and is meant to serve as a tighter substitute. The camera operator onsite will have intercom communications with the producer in Secaucus, but not with anyone in the traditional production truck, and will also be able to hear in-game announcer commentary in their ear. According to Hellmuth, this effort is in direct response to the usership data related to NBA League Pass. Last season, the service generated a record 26.7 million game views and more than 1.2 billion minutes viewed. Setting a new high mark for digital subscriptions sold in a season, it finished up 10% from the previous season. Hellmuth notes that approximately half of NBA League Pass viewing is done on a mobile device. 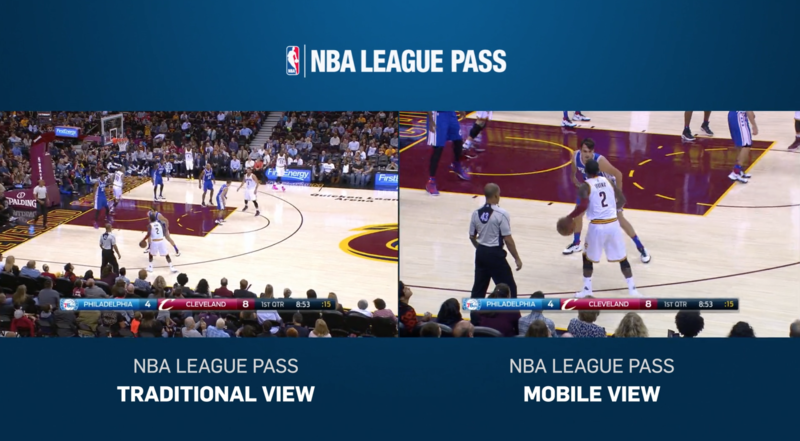 NBA League Pass subscribers will have the option to access NBA Mobile View as an additional streaming option alongside the traditional home and away broadcasts, and it will be available on any out-of-market game all season. Hellmuth says the the option to stream the standard broadcast will also be available because NBA Mobile View is a beneficial option only for users watching on mobile phones. Anyone watching on a larger tablet or throwing the stream onto a TV screen via a streaming box or gaming console would likely want the traditional cut of the game. NBA Mobile View is set to debut tomorrow and will be available for viewing as part of NBA League Pass’s free-preview period, which runs Oct. 25-Nov. 1.